I caved the other day and succumbed to a craving for crispy, golden delicious fried chicken. Unfortunately for my waistline, BonChon Midtown is way too accessible for me, so there I went for a Sunday lunch. I've been back many times since I first posted about them back in October. Since then, they have added a lot of items to their menu. 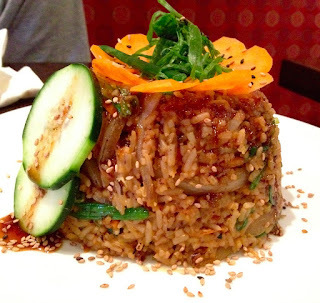 One dish which I particularly enjoy is the Egg + Scallion Fried Rice for $6.50. It's listed as a 'side', but it's actually a very decent portion size, definitely shareable! If you happen to make it to BonChon Midtown one of these days, believe me, you won't regret it!